Everything you Need All in One Box! 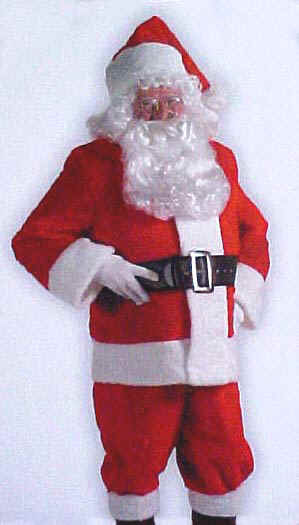 This Complete Santa Suit is made of lightweight soft polyester. 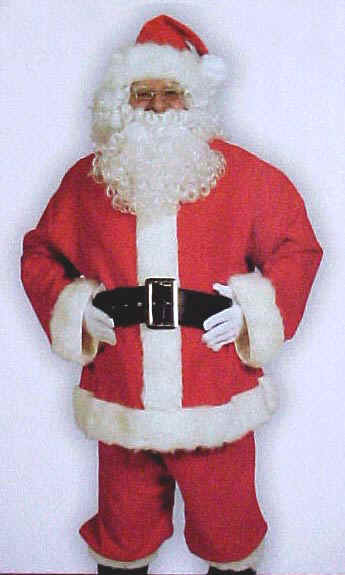 The Santa Suit comes with coat with white plush trim, pants with pockets, Santa hat, belt with buckle, boot tops with white plush trim, Santa gloves, glasses, eyebrow stick, wig and beard. Complete All in one Santa Suit on Sale. Give a Santa Suit as a Christmas Gift! Boxed in Gift Box. Sized by men's clothing size. This is a Complete Plush Santa Suit made of thick plush fabric. The Plush Santa Suit comes with coat with white plush trim, pants with pockets, Santa hat, belt with buckle, boot tops with white plush trim, Santa gloves, glasses, eyebrow stick, wig and beard. Complete All in One Santa Suit on Sale. Give a Santa Suit as a Gift! Boxed in Gift Box. Santa Bells can be used on wrists, hands, around ankles or attached to your clothing. There are three silver bells on an 11" long black vinyl strip that has a Velcro closure. Santa Jingle Bells are loved by all! Santa wrist bells on Sale! Santa Gloves are made of bright White Stretchy nylon. Men's one size fits all. Quality dress gloves with front seams. These White Santa Gloves are a prefect accent to our Santa Suits! Santa Gloves on Sale! Santa Toy Bag is an Extra Large size of 29"W x 36"L. These Santa Bags are made of red Plush fabric with a white drawstring. Santa Toy Bag's come in handy for the big loads of toys! Santa Toy Bag on Sale!